IFW Global offers a range of Asset Recovery services both local and cross border. If you have been a victim of a scam or organised fraud, we have an international team that has recovered millions of dollars in assets for clients. For further information or to discuss assistance, fill in the attached form and our team will be in touch. IFW Global’s private investigators work closely with law firms in Australia and worldwide. We can help you find the evidence you need in complex legal matters. 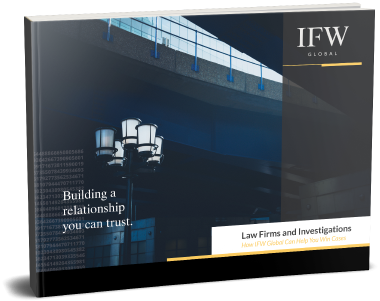 Download our free ebook to learn more about how IFW Global can assist you in your legal matters. 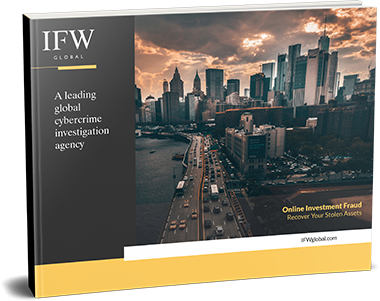 IFW Global work in close alliance with international law enforcement agencies around the world to combat cybercrime and recover your stolen money. Download our free ebook to know more about online investment fraud and how to recover your stolen assets. Our extensive network of international investigators and contacts regularly brings results to clients and companies who have been targeted by serious criminal networks or fraudulent parties. 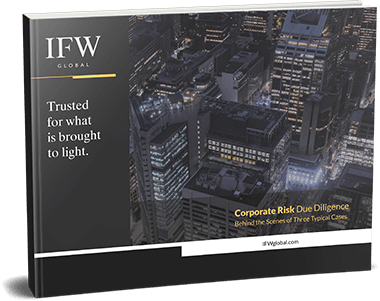 Download our free ebook to discover how IFW Global helped recover assets for our clients in three typical cases. Successful companies have IFW Global behind them. The effective and fast collation of safe, reliable and quality information gives them the edge when the truth matters. Whilst traditional crime continues to grow, the threat of cybercrime is one of the most defining issues of modern times. As the Internet continuously expands, online criminals are finding sanctuary in unregulated environments around the world. However, as cybercrime trends evolve, so do we. IFW Global has teams in Cybercrime, Fraud, Investigation and Asset Recovery - offering both high net worth individuals and corporations, peace of mind, discretion and effective options when crime threatens their assets and the value held by their stakeholders. For many years, IFW Global has been investigating, exposing and disrupting financially motivated criminals and syndicates in all parts of the world. We deliver valuable protection through targeted online investigations, covert surveillance operations and by regularly referring intelligence and evidence to state, federal and international law enforcement agencies. How can surveillance help in fraud investigations and asset recovery? Al Jazeera has released a documentary made around the recent dismantling of a transnational criminal syndicate based in Manilla facilitated by IFW Global's Ken Gamble. Fugitive Peter Foster Located by IFW and Arrested!